Habitat: Water Dropwort is native to Europe, western Asia and North Africa. It prefers wet soils, and can be found in slow moving or stagnant water, in marshes and by the sides of streams. 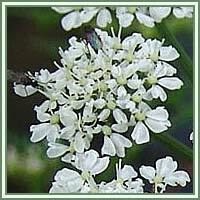 Description: Water Dropwort is a perennial plant, growing to 1.5 meters. It has densely arranged, long and narrow leaves. Flowers are borne in long terminal spikes. They are small, pale pink or white, with few rays. Fruits are numerous, crowded and angular. Water Dropwort is in flower from June to September. Medicinal use: The fruit has diaphoretic, diuretic, expectorant and pectoral properties. Its use has shown to be very helpful in the treatment of chronic pectoral affections, dyspepsia, intermittent fevers and obstinate ulcers. A homeopathic remedy is made from the fruit, helpful in cases of respiratory problems, coughs and bronchitis. Safety: This plant should be used with great caution, since all parts of the plant are considered poisonous. Use it only under the supervision of an experienced practitioner. 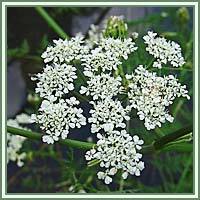 Excessive consumption of Water Dropwort fruit causes vertigo and intoxication.